Finally! After a long summer of being mostly at home, we’re on the road, headed to (largely unplotted) places unknown. Like every other geezer with an RV of some sort, Labor Day signals, for us, the beginning of our camping season – families are back at work/school. Campgrounds are quiet – ready for us to drop in, unannounced. Cooler weather. Ahhhhh….we’re ready for an extended camping trip of 60 days, or so. After lots of discussion, we decided to head north, and I do mean NORTH! International Falls, MN – here we come! Right now, we’re at Burt Lake State Park, about 30 miles south of the Mackinac Bridge, which connects Michigan’s two peninsulas. We scored a great site right on the lake, protected by an enormous willow tree of some sort. No neighbors. One of the reasons for selecting this park was that was wanted to be able to cycle The North Central Trail to a large beaver dam, about 20 miles away, which we visited two years ago. It was truly an engineering marvel. Here’s a photo from 2013…. We were hopeful of seeing evidence of new construction, and perhaps even spotting a beaver at work. What a disappointment to see that the dam/lodge have apparently been abandoned. 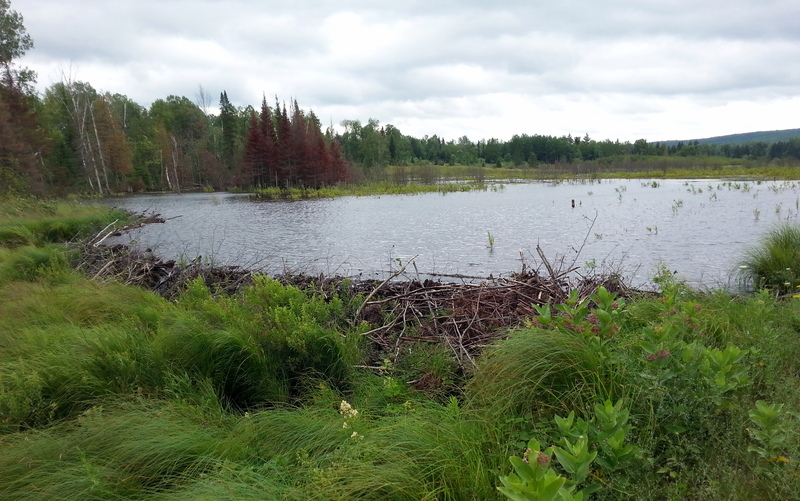 Perhaps the Michigan DNR has relocated the beavers? Or, they’ve just moved on? There are lots of green plants growing atop the old structure, which still holds back a significant amount of water. But, it’s obviously not an active project. We are ridiculously saddened to see this abandonment. 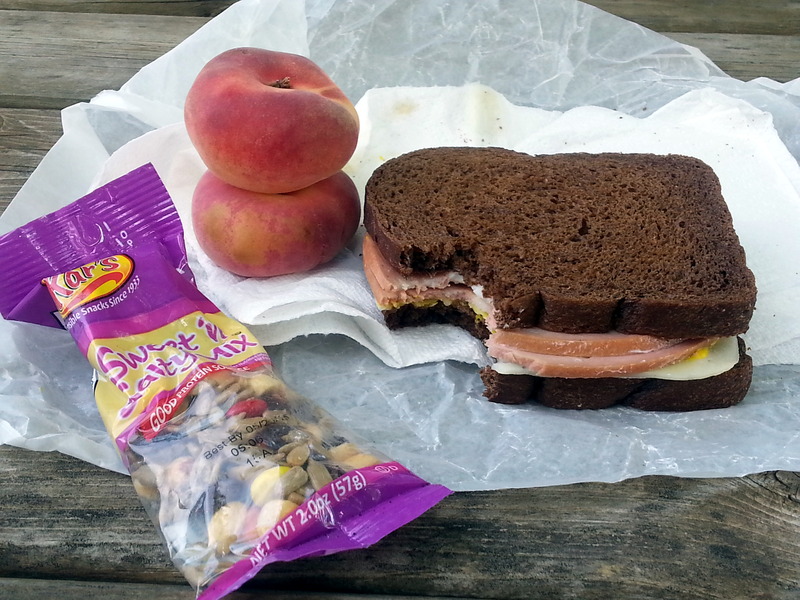 We did cheer up a bit after stopping at a campground for our picnic lunch of a mortadella sandwich with a Michigan donut peach. I’ve seen them called Saturn peaches elsewhere, but in our area, they always seem to be known as donuts. Pure summer bliss. On the way home, we purchase a whole smoked whitefish, intending to have an extraordinary Happy Hour feast, but we decided to save it for tomorrow. 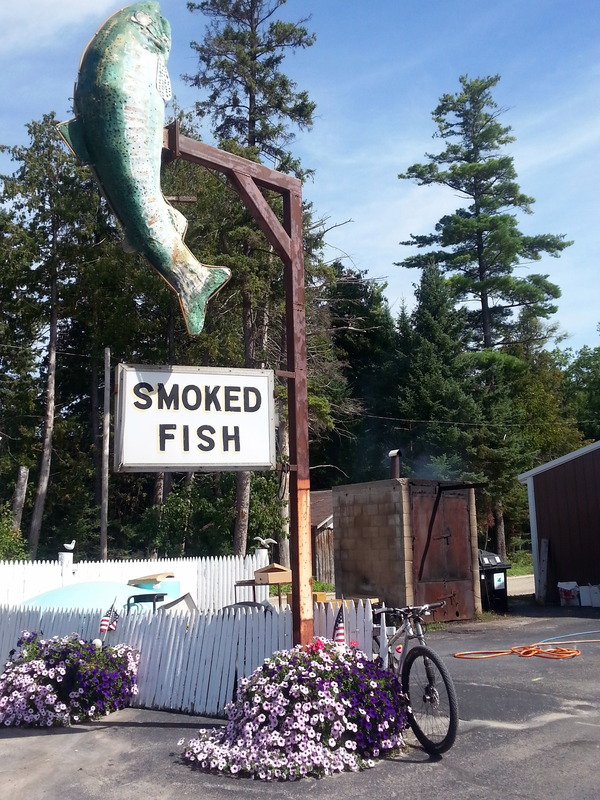 Check out the old smoker behind my bike – it was huffing away. Our original plan was to head to Tahquamenon Falls State Park for a few days, and use it as our base to explore Whitefish Bay area. But now, we think we’ll stop first at Bay View Campground in the Hiawatha National Forest. It’s very close to an 1870 lighthouse, and overlooks the spot in Lake Superior where the Edmund Fitzgerald sank. We’ll hike/pedal around there for a few days, then move on to the Falls. Having no agenda is the best agenda of all. 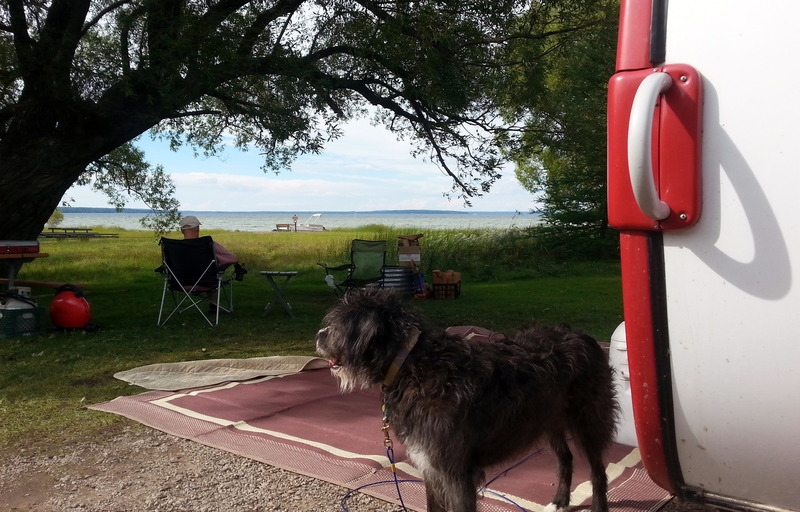 This entry was posted in camping, cycling, great outdoors, Michigan, retirement, state parks, T@DA and tagged camping, cycling, Michigan, retirement, road trip, simple camping, state parks by Judy Crankshaw. Bookmark the permalink. So the mortedella threw me…I was thinking it must be one of the Michigan things, like the pasty! Ten years ago, while on a bikeride, we visited a lighthouse that shows the video about the Edmund Fitzgerald. I’m thinking its the same place. Glad you are on the road. Our anchors are coming up in a month or so. We are going to cycle to the lighthouse today. It’s about seven miles from our campground. The rain has (finally) moved on, leaving cool delightful dry air behind. Are you heading to Quartzsite again this year? Bet you are anxious to get on the road again. Maybe we will run into you Out West somewhere this winter. That would be great! Yes, on the West! It would be lovely to run into you….think Superstition Mtns and Lost Dutchman SP. Great for hiking! We haven’t made it to Lost Dutchmen yet, so that sounds like a good plan. Let’s see if we can make this happen. I just love following no-agenda travels! 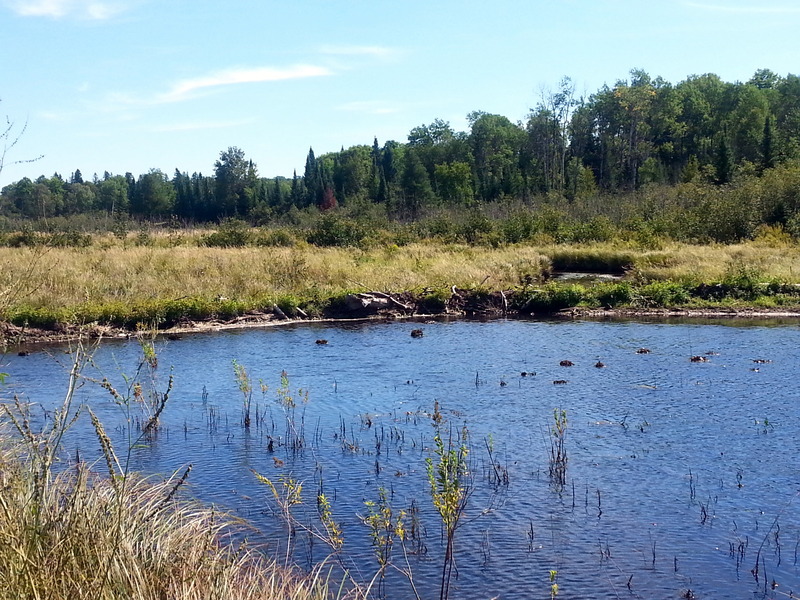 Was fascinated by the huge beaver dam. I have only seen small ones. Seems like we get in much less trouble if we take things slowly. No agenda is nice, but n of always doable. Thanks, Sharon. Hello, read your blog and found it to be very nice. I had researched the Solo Wood Burning Stove and found you that way via Google. So…you are heading to International Falls aka Icebox Of The World. I know this as I lived in Minne-SNOW-ta for 17 years, cold long winters. Yes, you are from Mich but MN is very different kind of cold, bone dry even when it snows a full October Blizzard! Anytime after Oct 15th you could find yourselves grounded to a halt by an overnight, unannounced snowstorm. Point is be very watchful of the skies more than the local news weather…they often get it wrong and the locals wonder how the weather crews ever keep their jobs, lol. Anyway, I tell you this because we too RV in a tiny 20 ft. Airstream. We always make it a point to be certain to leave MN before the first snow fall and that always means before the end of October. Google for Surprise Blizzards in Minnesota and check out the dates they fell on. Certain years they do come early. Just sayin’…many a times we were delighted to see MinneSNOWta in our rear view mirrors as we headed south to the next state and down to Georgia again. Again, your blog is very nice, enjoyed it. May the ROAD be always good to You and Yours! WANDERLUST, It’s A GOOD THING! Pamela, it will be a long time before I forget Minne-SNOW-Ta. Thanks for a good laugh. A 20 foot Airstream would be pure luxury. But, small rocks, right?? Safe travels. Thanks for your comments. So far, so good. Thanks, Irene. We are working on it. What did you do to my prize-winner Quintana? Mortedella is nor spicy, but like a suoer-fatty, silky baloney. So good. The diminished beaver dam was a real bummer. John first saw it about four years ago. We need to find out what happened to it. Your trip looks good so far, as well! It sounds all so good, a 60 day camping trip without having to be any one place at any one time! I may buy a lottery ticket tomorrow in hopes of being able to retire early. Good luck with the lottery, Jerry. I’m rooting for you. Here at Burt Lake SP, we are overrun with raucous pileated woodpeckers. Man, what a wonderful racket – you would love it. “Having no agenda is the best agenda of all.” I’m going to steal that.